Swanky Digs: I love this idea. I've finally got some time off. Which means I finally have some time to relax. Which means I've been indulging in a little more wine than usual. Which means when I was going through my bookmarked DIY project ideas and came across this one from Readymade via Apartment Therapy I was rather intrigued. How smart is this? 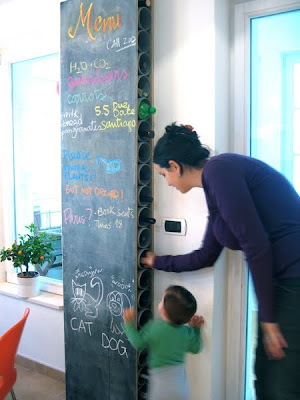 And if you're over the whole chalkboard thing you could do cork or wallpaper or just about anything else you can think of.